Giving away these six vintage books. Picking a winner, back shortly. Love, love, love the Hardy book, Far From the Madding Crowd...always wanted to say Maddening when I was younger (still do). That spines on those are beautiful! Count me in! Robinson Crusoe is calling me from (and for) the cover. Oh please let it be me. These look great! Haven't read "Of Mice and Men" yet (was assigned Cannery Row in High School). What a great collection! 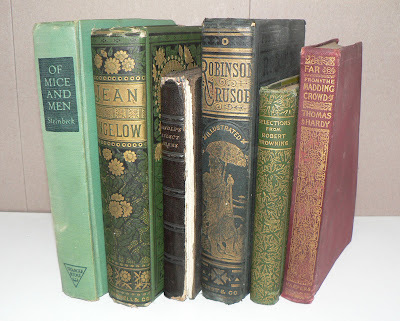 I'd love to win these for my son who loves Vintage books and collects them. Ooh! I just love Hardy. Such beautiful books! Another beautiful giveaway! Thanks always. I continue enjoy your interesting posts. Gorgeous books! I just love Hardy. these books are so awesome! great giveaway!! As always would love to have these! How much would I love to win these gorgeous books?! Some of my all-time favorite reads and I am totally a repeat-reader. Please, please! I haven't read everything here (not surprisingly), but there are some awesome books included. I'd love to be able to pass on that Crusoe to a friend who has sent me several books as "just because" gifts. Drop my name into the hat. Would love these! They'd go great with my growing collection of antique books! These would be a great addition to my country cabin library! Please enter me in the giveaway! Thank you! My, oh, my! How generous! Absolutely beautiful. Just found this website through bookshelfporn.tumblr.com... love this! They're beautiful! That's how I love to own my classics--old, vintage version. I'm in. For the Browning. Lovely volumes. Count me in. Such lovely books! Living in Steinbeck country I'm excited to also see "Of Mice And Men"! Thank you for offering this giveaway! Beautiful books! Count me in! Nice selections... I'd love to have these. I would love to have these! They're gorgeous. Fabulous looking books - nice and used! I have to admit I've never read Hardy, tho it was one of my mom's favorite books. I guess if I won I'd have to fix that, huh? Count me in to the contest! I love these contests, and just seeing the beautiful bindings on these old books! I haven't read Browning in many years, but I'd love to. I had a great English teacher in high school who taught me to appreciate poetry; I'd always hated it before. Thanks Mr. Budzien! Old books possess a beauty to which new books cannot hold a candle. yay books! would love to win these for my collection. Count me in! I particularly want Crusoe. I would certainly love to have this collection. Much appreciated! I'd love to be a winner! Those book are so pretty! I would be very pleased to be considered. Thank you. I am very interested. I would love to win these to give to my son that loves old books. He just moved and these would be a great" new"addition to his collection! Interested! Of Mice and Men is one of my favorites. I read digital books on occasion but nothing beats holding a print book and turning the paper pages. I don't even mind the occasional whiff of ink and glue! Enter me in the give-away! Please please please enter me! They look great! Sign me up! I got a bunch of old wine crates to serve as a bookshelf so now I have more shelf space. Bring it on! These are beyond beautiful! I can see them on my shelf. What beautiful books! I love the look and feel of vintage books.